One could thus translate literally "Xixiang Ji" by "History of the house of occident". If there is a classic of the old Chinese theatre, the zagu style, it is well that one. The piece was written, partially apparently, by WANG Shifu, a playwright of the Yuan period (1279-1638), who inspired it from a fable by YUAN Zhan (779-831), "Yingying zhuan", in which the author tells the love disappointments of the beautiful Yingying, who gives herself, before marriage, to a somewhat frivolous well-read. WANG Shifu's adaptation, much more sanctimonious, is one of the most beautiful traditional love stories. The house of the western wing is where Yingying's mother lives, took in by the temple's superior, a friend of her lost husband. She is accompanied by a young servant girl, HONG Niang, who serves Yingying ever since her childhood. It is HONG Niang who will be the link between the two lovers so as to help them so as to carry out their common dream of happiness. 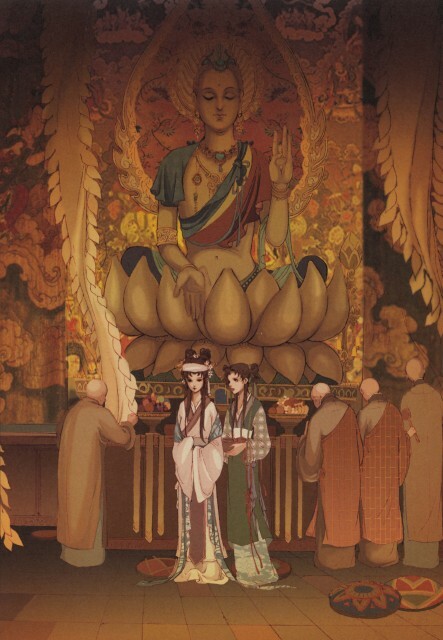 SUN Jiayu's manhua version is largely inspired by WANG Shifu's piece; even if the main characters' names have been changed (Yingying has become for example YE Pianpian, which means "elegant and beautiful woman"). The play takes place under the Tang dynasty (618-907), in the city of Pu Zhou, now known as Youg Ji, in the Shan Xi province. Here is then a real treasure of the classical Chinese literature, magnified by the young GuoGuo's graphical talent. Her real name being Guo Chaoxu, this young Chinese artiste, graduated from Shanghai university (specialized in costume drawing), fulfils here her first manhua, thus proving a great mastery of her art, particularly in the rendering of colors. He enters the world of the manhua in 1980. In that decade which announces a renewal of the genre, he participates to a great number of editorial projects, but it is in 1992 when he fulfils his first serie. Since 2000, with his Jing Ding Company studio, he has produced more than ten manhua series, all published in continental China.